A new composite image of M87 features X-rays from Chandra (blue) and radio emission from the Very Large Array (red-orange). This massive galaxy contains a giant black hole at its core that is producing massive jets of energetic particles. The interaction of these jets with surrounding hot gas has similar properties to the recent eruption of an Icelandic volcano. The interaction of this cosmic "eruption" with the galaxy's environment is very similar to that of the Eyjafjallajokull volcano in Iceland that occurred in 2010. With Eyjafjallajokull, pockets of hot gas blasted through the surface of the lava, generating shock waves that can be seen passing through the grey smoke of the volcano. This hot gas then rises up in the atmosphere, dragging the dark ash with it. This process can be seen in a movie of the Eyjafjallajokull volcano where the shock waves propagating in the smoke are followed by the rise of dark ash clouds into the atmosphere. 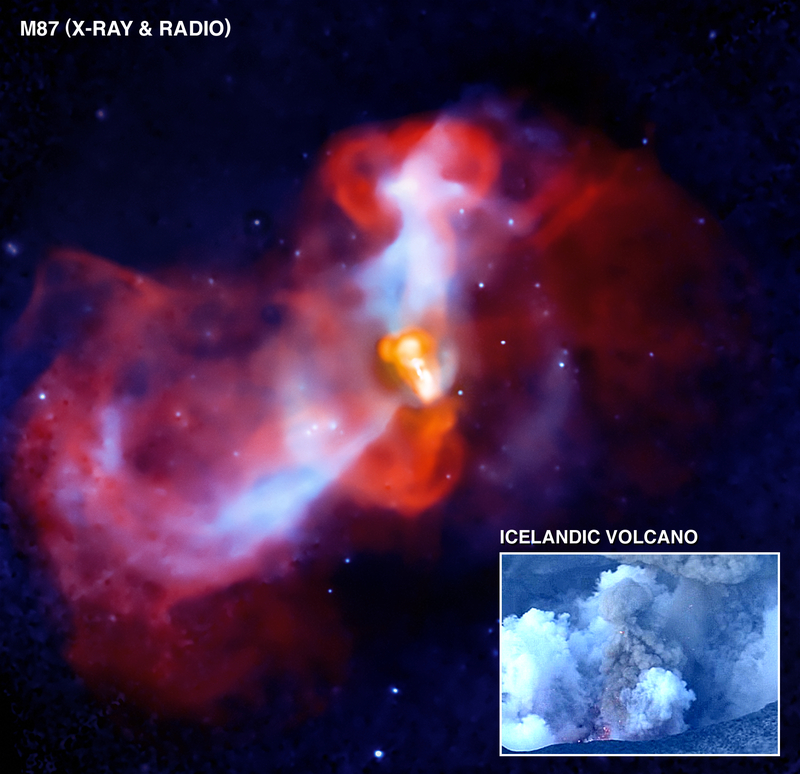 In the analogy with Eyjafjallajokull, the energetic particles produced in the vicinity of the black hole rise through the X-ray emitting atmosphere of the cluster, lifting up the coolest gas near the center of M87 in their wake. This is similar to the hot volcanic gases that drag up the clouds of dark ash. And just like the volcano here on Earth, shock waves can be seen when the black hole pumps energetic particles into the cluster gas. The energetic particles, coolest gas and shock waves are shown in a labeled version. Scale Image is 14 arcmin across (about 200,000 light years). References Werner, N. et al, 2010, MNRAS, in press. Million, E. et al. 2010, MNRAS, in press. The eruption of a galactic "super-volcano" in the massive galaxy M87. 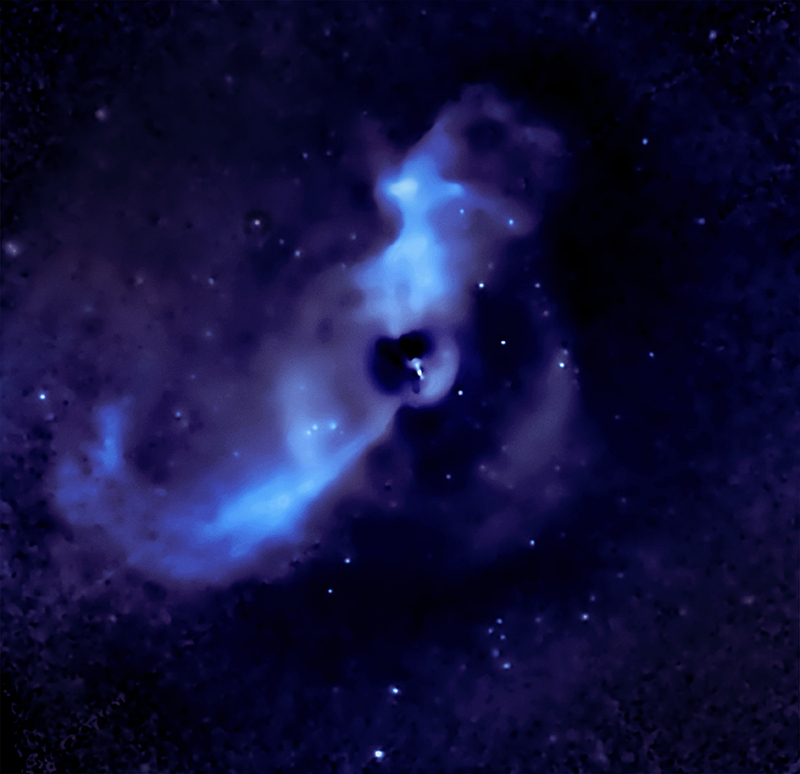 By combining X-ray data from Chandra with radio data from VLA. About 200,000 light years across. 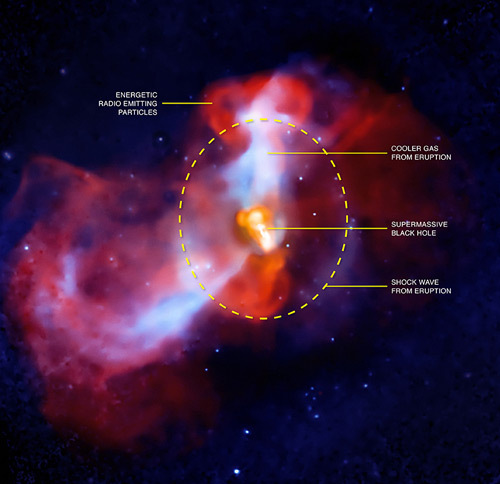 X-ray data from Chandra are blue and radio data from VLA are red-orange. In the constellation Virgo (the maiden), a Zodiac constellation visible in both Hemispheres.